Addiction Salon | Meet The Owner! 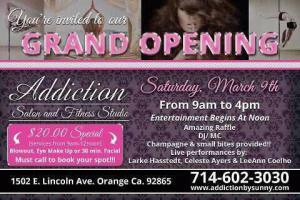 S unny Woodall is the Owner of Addiction Salon and Fitness Studio. She attended Cal State University, Fullerton where she danced competitively and Studied communications. Shortly after graduating in 2004, Sunny moved to Los Angeles where she worked as a commercial agent for Clear Talent Group. Sunny and her sister were spending thousands of dollars on extensions and decided to learn to do them herself. She took multiple classes and started to do extensions for clients in the agency. She decided to move out of the crazy city of LA and back to the OC to open a studio in her garage in Costa Mesa. Immediately her business took off. She had up to five clients a day and spent her night’s bartending. As her demand increased, Sunny decided to attend cosmetology school in order to expand her business. When Britney Spears shaved her head Sunny did her extensions and continued working with her and her dancers on every photo shoot and music video. Sunny completed Britney’s Blackout Album and became her personal stylist. Eight years ago She thought of the name Addiction. She wrote her business plan a year and a half ago after finally deciding to combine her two passions of Dance and Making women look beautiful, under one roof. She has always wanted to own a business and is so excited to be the owner of Addiction. Sunny LOVES her job and believes it is the best job in the world. She has always been passionate about making people look and feel beautiful. Sunny has become very close with her clients and feels blessed to meet to many amazing people. Sunny was always interested in Law, and if she wasn’t a hairstylist she would be a Lawyer. If you ask me, She makes a much better Legally Blonde than Rese Witherspoon! Her favorite color is Yellow and she loves the movie Ferris Buellers Day off. If you would like to meet Sunny and the rest of our staff in person, please come to our Grand Opening!! !